Pediatric patients needing hospitalization for conditions ranging from dehydration and asthma to pneumonia and GI problems can once again receive inpatient care at Cooley Dickinson Hospital, thanks to a team of dedicated nurses and an innovative partnership. “We’ve developed a comprehensive education plan and invested significant time and resources in preparing our new West 2 staff to care for pediatric patients,” said Margaret-Ann Azzaro, MSN, RN, CENP, director, Medical Surgical & Childbirth Services. Previously, changes in staffing had temporarily shuttered West 2’s ability to care for pediatric patients. But as of Dec. 17, Cooley Dickinson began admitting pediatric patients again. Nearly one month later, the number of young patients seeking care here – and the referrals to Cooley Dickinson – continue to grow. “We are not only committed, but very excited to be caring for the young patients and their families in our community,” Azzaro added. 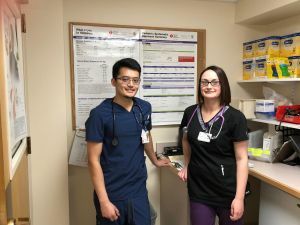 Parash Pijar, RN, and Samantha Cournoyer, RN, stand in the new West 2 pediatric resource room. The room, which used to be a utility area, now houses solely pediatric supplies, such as resource guides and age-appropriate vital sign charts; there is also refrigeration to store breast milk. Pijar and Cournoyer are two of the seven Cooley Dickinson nurses who participated in an innovative partnership with pediatric nurses at Newton-Wellesley Hospital. One reason West 2 is open to pediatric patients again is because of an innovative partnership between Cooley Dickinson and Newton-Wellesley Hospital, a member of Partners Healthcare. Recently, seven Cooley Dickinson nurses – Samantha (Sam) Cournoyer; Helen Folan; Oliva McDowell; Jieun Park; Parash Pijar; Courtney Preston; and Kasia Szymborn – completed clinical rotations where they learned and practiced pediatric nursing shoulder-to-shoulder with pediatric-trained nurses at Newton-Wellesley and earned Pediatric Advanced Emergency Assessment Recognition and Stabilization (PEARS) certification. Cournoyer also spoke highly of the training she and the team went through at Newton-Wellesley. Now having transferred that learning to Cooley Dickinson, she says she is impressed how the new pediatric program is developing. Azzaro praises the commitment of the new nurses. At the same time, she says, it’s also important to recognize our veteran pediatric nurses who have taken care of children at Cooley for many years. The pediatric playroom has been stocked with new toys. • A dedicated pediatric resource room that will house solely pediatric supplies, breast milk and formula storage, up to date resource guides/books, growth and age appropriate vital sign charts and more. • We have ordered wall hangings that will lend to a more child-friendly, welcoming atmosphere for our families. 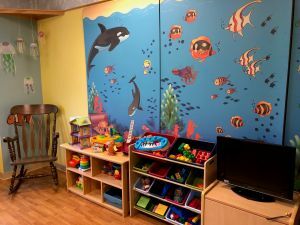 • Our play room has been terminally cleaned and set up with brand new toys. • Our pediatric treatment room has also been terminally cleaned. The supplies have been streamlined and stocked appropriately. This will serve as a safe space for our patients during procedures. Looking ahead, Azzaro added that the new pediatric program will continue to develop. “We recognize that we need to offer ways to maintain staff members’ competencies. In addition, we have developed a Pediatric Nursing Practice Council. 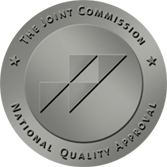 This council is comprised of pedi-trained nurses and follows a shared governance model in which staff nurses identify areas for improvement and utilize evidence-based practice to create solutions.